The lead–acid battery wis invented in 1859 bi French physicist Gaston Planté an is the auldest teep o rechairgeable battery. Despite haein a very law energy-tae-wecht ratio an a law energy-tae-volume ratio, its ability tae supply heich surge currents means that the cells hae a relatively lairge pouer-tae-wecht ratio. Thir features, alang wi thair law cost, mak them attractive for uise in motor vehicles tae provide the heich current required bi automobile starter motors. As thay are inexpensive compared tae newer technologies, lead–acid batteries are widely uised even when surge current is nae important an ither designs coud provide higher energy densities. Large-format lead–acid designs are widely uised for storage in backup pouer supplies in cell phone touers, heich-availability settings lik hospitals, an staund-alone pouer seestems. For thir roles, modified versions o the standard cell mey be uised tae improve storage times an reduce maintenance requirements. 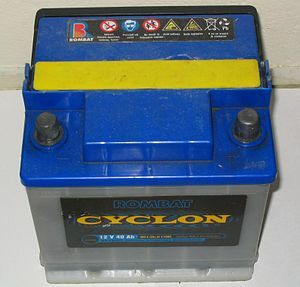 Gel-cells an absorbed glass-mat batteries are common in thir roles, collectively kent as VRLA (valve-regulated lead–acid) batteries. ↑ "Trojan Product Specification Guide" (PDF). Archived frae the oreeginal (PDF) on 2013-06-04. Retrieved 9 January 2014. ↑ Cowie, Ivan (13 January 2014). "All About Batteries, Part 3: Lead-Acid Batteries". UBM Canon. Retrieved 3 November 2015. ↑ Crompton, Thomas Roy (2000). Battery Reference Book (3rd ed.). Newnes. p. 1/10. ISBN 07506 4625 X.